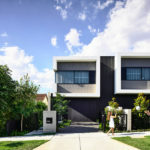 Robert Puksand of Australian architecture & interior design practice Gray Puksand, has designed a modern house for himself and his family, located in the Melbourne suburb of Brighton. 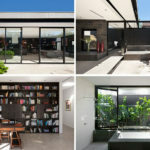 At the front of the low maintenance house, a ramp leads down to a sunken garage that opens up to a basement level with a home gym and storage. Beside the ramp, there’s a walkway that guides guests to the front door. On one side, there’s frosted panels hiding the pool from view. On the other side, there’s a bright yellow perforated screen made from exterior grade MDF. The main floor of the home is the primary living area. The living room opens up to the patio outside through large black-framed sliding glass doors. To tie in with the black frames, a Bathyscafocus suspended fireplace hangs from the ceiling. The living room is also open to the kitchen and the dining area. The boldly colored kitchen has a curved orange island, while the black cabinets, with an integrated fridge, provide a strong contrast and help to make the color of the island ‘pop’. The flooring throughout the house is a hand-crafted polished concrete floor. Another area that is brightly colored is the study, that’s located in a small nook, around the corner from the kitchen and dining area. 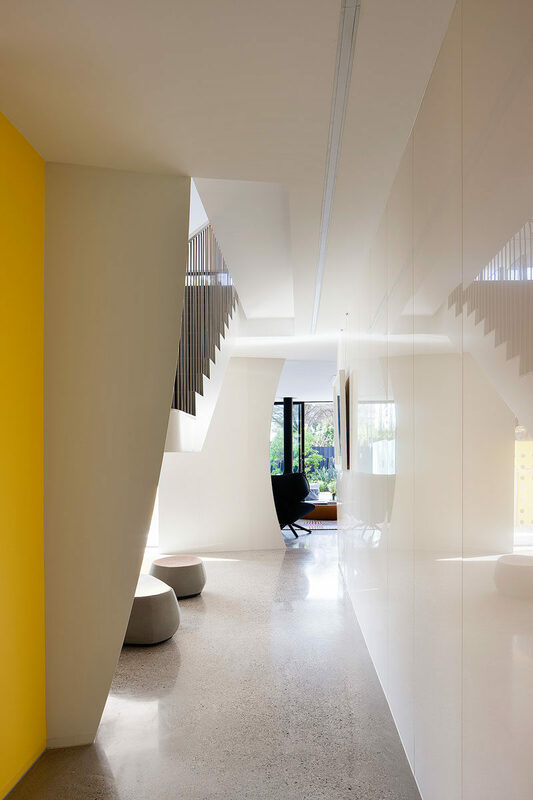 Bright yellow supports hold the white wall shelves and floating desk in place. The dining area, which is mostly black and white, has a piece of art from Robert Puksand’s personal collection hanging above a minimalist sideboard. 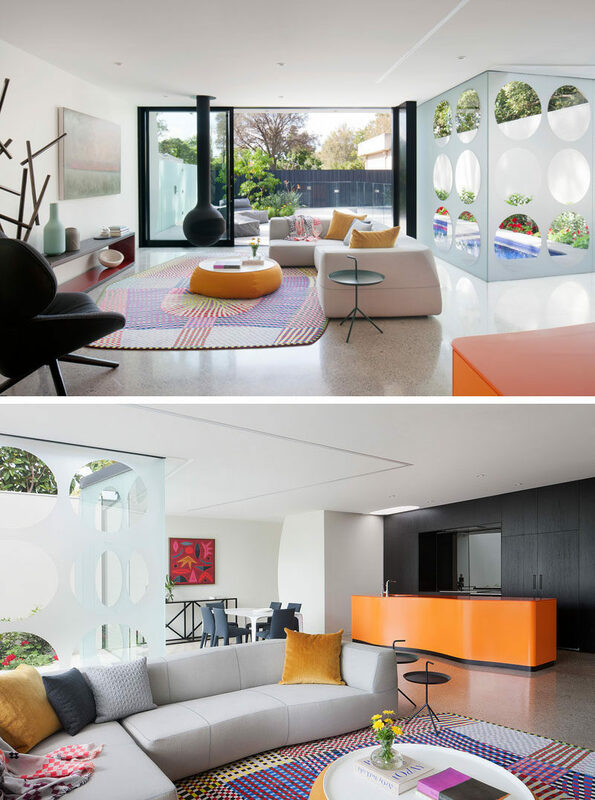 Decorative circles on the windows adds a fun shadow to the interior of the home. Outside and at the front of the home, the outdoor patio sits next to the swimming pool. 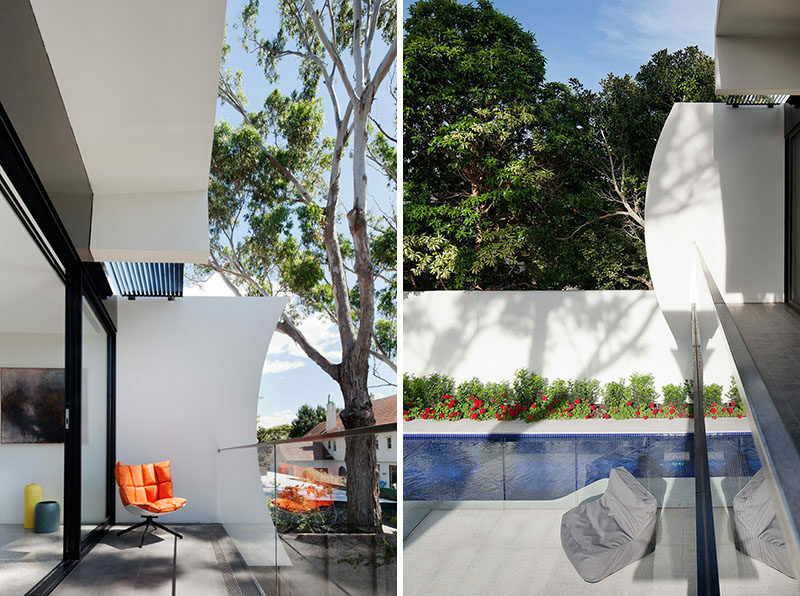 On either side of the upper floor balcony, crescent shapes have been applied at the ends of the wall, providing a sculptural appearance and privacy. 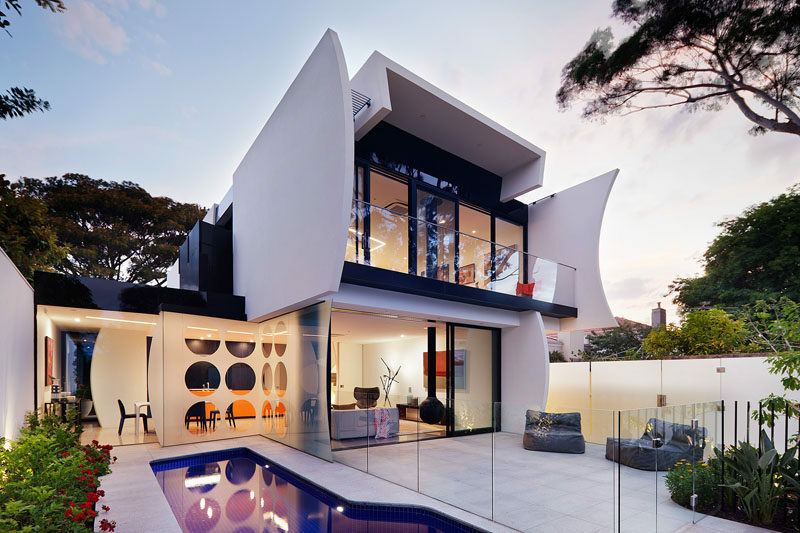 Those crescent shapes have also been used for the main floor too. At the rear of the home the crescent shapes continue, and can also be seen inside the master bedroom. Large sliding doors open the bedroom up to the small backyard, and allow plenty of natural light to fill the bedroom. Behind the master bedroom is a walk-in closet and the master bathroom. 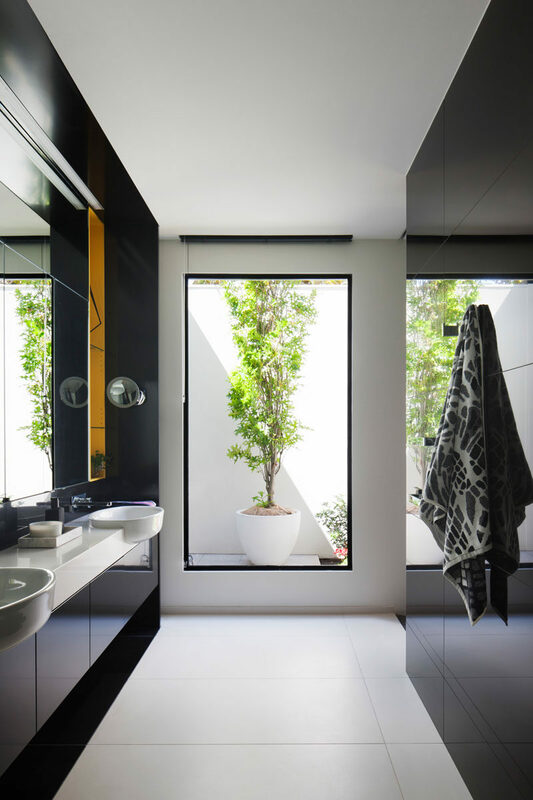 In the master bathroom, a tall window perfectly frames a potted plant outside, while a dual sink vanity with black cabinetry and a white counter makes sure there’s plenty of room for personal items. There’s also a toilet and a walk-in shower. 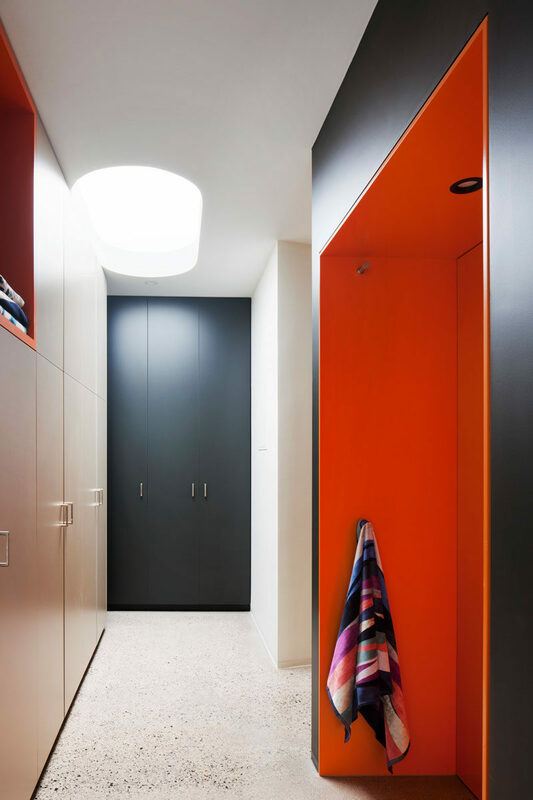 Back into the main area of the home, there’s a laundry room with floor to ceiling cabinets, and brightly colored pockets of open storage areas. Around the corner from the laundry are a set of stairs that lead to the upper floor of the home. 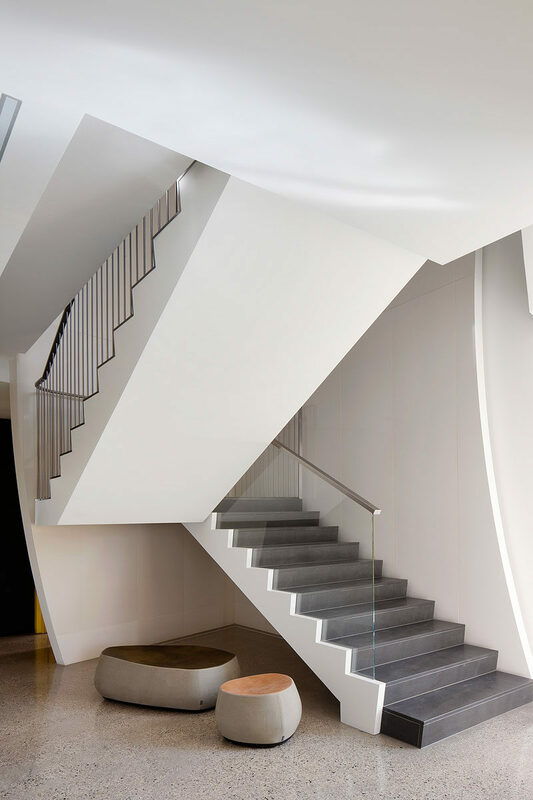 Solid slab honed bluestone has been used for the stair treads and rises. At the top of the stairs, there’s a small gallery area with multiple pieces of artwork and a sitting area to sit back, relax and appreciate the art pieces. Off the gallery is the balcony that we saw earlier. It looks out over the patio and swimming pool at the front of the house. To truly understand the layout of the home, here’s the floor plan.